Le deuxième souffle, Jean-Pierre Melville’s ninth and to that point most commercially successful feature in France, was an important watershed in the director’s career. It points back to the somewhat abstract, elemental, and iconographically precise hypermasculine gangster milieu of Bob le flambeur (1956) and Le doulos (1962) and forward to the more expansive, rarefied, and philosophically circumspect works—such as Le samouraï (1967) and Le cercle rouge (1970)—that followed. It was also Melville’s last film to be shot in black and white, pushing the tonal qualities and gray scale of the image to new levels. Despite its troubled production history—it was shot in two stages in Melville’s studio and various Marseille and Paris locations—it is a masterful work that ultimately brought to a close what Melville himself described as a period of several years “in the wilderness.” Still, despite the importance of Le deuxième souffle to understanding Melville’s career, it has remained one of his most underrated, and least examined, films. As Ginette Vincendeau has argued, Le deuxième souffle marked the consolidation of Melville’s commercial and mainstream critical reputation in France, while also almost violently pushing him further away from his critic and filmmaker “colleagues” in the nouvelle vague. In some ways, the film’s preoccupation with issues of loyalty, heightened professionalism, solitude, and betrayal resonates clearly with Melville’s own status as an egotistical, reticent, fringe-dwelling figure in French cinema, who in spite of his success never really claimed membership or complicity in any established movement or “wave” of filmmaking. Melville’s subsequent critical reputation has suffered from the schisms caused by shifts in these perspectives and allegiances, as well as from a suspicion about his professional and personal indulgence in the forms and archetypes of American cinema, and it is only in the last fifteen years or so that he has once again been championed as one of the great French directors. As is common in Melville’s later films, Le deuxième souffle opens with a title card that aphoristically sets out a kind of fatalistic mantra that frames the action of the story: “A man is given but one right at birth: to choose his own death. But if he chooses because he’s weary of his own life, then his entire existence has been without meaning.” It is always difficult to fully relate these bleak, solipsistic statements to the films that follow, but they tend to set up a particular attitude and sensibility that then casts a pall across the film. I’m not so sure that Le deuxième souffle explores the full implications of this statement, but its foregrounding of destiny, death, and bleak existential choice matches the elemental concerns of the film. This stoic mantra is immediately followed by one of the greatest and most exquisitely pared-down sequences in Melville’s cinema, a wordless flight from prison that demonstrates the director’s devastatingly powerful economy of means. This opening represents Melville’s unadorned narrative cinema at its most abstract and rarefied, framing objects and spaces as large tonal blocks and shapes and focusing minutely on the actions and gestures of the characters. During the escape of Gu Minda (Lino Ventura), who will subsequently occupy the nominal position of protagonist in this tightly focused but dispersive narrative, we can feel the physical sensation and tension of his actions. In fact, this muted but palpable physicality is often all we can clearly grasp on to in the murky half-light of the compositions, a corporeality that nevertheless emphasizes the weariness and age of the character and helps communicate the sense that the film is really dealing with what we might call “the end of things.” As Melville suggested, it is almost as if Gu has been waiting—or on reprieve—for ten years in order to break out and fatalistically arrange the complex pattern of actions that will lead to his bloody death. There is nothing about Gu’s character, or his movement through the film, that suggests he will escape such a fate; all that is at issue are the ethical and ritual dimensions that this entails. The “second wind” of the title is really just an extended final breath. This opening sequence also creates a series of echoes with other films that share Le deuxième souffle’s key aesthetic and thematic preoccupations. Melville’s film is based on a 1958 Série noire novel by José Giovanni, the author of Le trou, itself a precise and fatalistic study of the ultimately futile buildup to a prison escape, made by Jacques Becker into one of Melville’s favorite films (shot in Melville’s studio in 1959). The intense, elemental, extended but highly concentrated opening of Le deuxième souffle also brings to mind Robert Bresson’s A Man Escaped (1956), a film and director often cited in comparative accounts of Melville’s aesthetic. But whereas Bresson builds an extraordinary degree of tension by carefully selecting and documenting a chain of actions that lead to inevitable and triumphant release, Melville stages his escape as a moodily fatalistic prelude to inevitable death. Nevertheless, these two directors do share significant qualities, not the least of which is their capacity to break up actions into a series of meticulously framed parts that emphasize gestures, as well as a sense of being in the world. 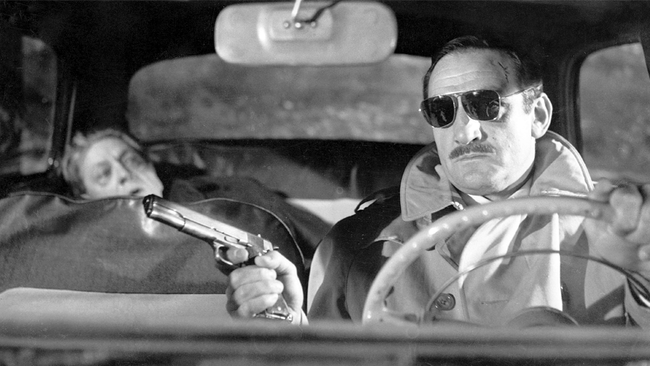 Like many of Melville’s later films, Le deuxième souffle is a kind of “minimalist epic” that has the precision of a scalpel and the intensity of a full-blown melodrama, without being restrained by the coolness of the one or the histrionics of the other. It is a contradictory and paradoxical work in which the pulse of life appears to be pumped in and withdrawn at the same time. These qualities are directly related to how Melville represents physical actions and gestures. Gu’s movements throughout the film are both organic—they seem natural and appropriate—and regimented by the closed-in environments he is placed within. For much of the first half of the film, we watch Gu as he waits for the opportunity to break free from the tawdry, cell-like microworlds he is forced to hide in. Ventura’s performance emphasizes his stocky physicality, the on-set tension between director and actor perhaps bringing a very real sense of hostility and irritableness to his character (though like other Melville characters, he also displays an extraordinary, almost Zen-like patience that is linked to his professional typology). Also typical of Melville, there are numerous shots and scenes that show us characters traveling in cars, but here these act less to open out the landscape and allow these figures the freedom of mobility than to show the restrictedness of the space they occupy and move within (one of the most hypnotic sequences involves Gu traveling on a series of buses, his bulky frame squeezed into ill-fitting seats, to reach his next hideout). In Melville’s cinema, characters are rarely given a complex psychological dimension and are defined and judged by the “purity” of their actions. Gu is a brutal, driven, and pared-down figure who gains respect, even from Inspector Blot (the wonderful Paul Meurisse), who recognizes his murderous brutality, because he ultimately conforms to and doesn’t break from his “code.” In fact, the key crisis for this character occurs after he is tricked by the police into informing on his criminal collaborators. His hysterical reaction, including an attempt at suicide, underlines the definitional importance of his inscrutable ethical code. But this code or typology is also central to the ethics of the film, and Gu is rewarded with a degree of respect and a heroic death for maintaining it. One of the key reasons Melville’s cinema appears so contemplative, measured, restrained, even surprisingly moral, is its extraordinary visual and aural palette. Typical of Melville’s style (and his ethical perspective), Le deuxième souffle relies on a mixture of seeming point-of-view shots and a vast array of detached perspectives (which rarely repeat camera setups). Thus while the film’s characters are both interior and exterior to the situations they find themselves in, we are also both inside and outside their view of them, engaged in the film’s action while also observing it. It is this combination of direct engagement and distanced contemplation, of feeling character and observing actor, as well as the joining together of what, at moments, seems like real-time observation and aesthetic abstraction (tonally graded and self-consciously staged compositions), that defines Melville’s cinema. It is a cinema of almost pure sonic and visual signs. These signs are isolable but also form part of a synthetic system or world (Le deuxième souffle’s soundtrack often has the quality of a sculptured, individuated, somewhat experimental soundscape that emphasizes specific pitches and tones). Like many of Melville’s films, Le deuxième souffle pivots on a dazzling set piece that relies upon these qualities of observation, varied perspectives, and an almost documentary-like rendering of actions. This central heist sequence is a study in contrast. Whereas most of the film is defined by its cramped and dank interiors, or the minimalist gaudiness of some apartment and nightclub settings, the heist is staged in a vast, windswept, and elemental environment that almost seems to visibly shock the gang. The sequence is a model of both restraint and meticulous detail, showing us a series of actions, gestures, and perspectives that constitute the event. It shows Melville as a complete master of framing, mise-en-scène, and montage, combining and fragmenting each to give us the full sense of this dramatic episode, including its atmospheric brutality. The precision of the sequence mimes the matter-of-fact but bravura professionalism of the gang, as well as the epic minimalism of the film itself. It is a remarkable display, but it is also absolutely in keeping with the pinched, battened-down, almost parched theatrical realism of the rest of the film. A little too much has perhaps been made of the fact that Melville was an avid cinephile who actually lived above his own film studio, actively blurring the distinction between the world of cinema and everyday life in much the same way that his films do. Nevertheless, much of Le deuxième souffle can only be accounted for in terms of its immersion in and refinement of the iconography and generic conventions of Série noire, film noir, and the American gangster film. Melville’s films in this mode have the quality of afterimages, modernist apparitions of established models fueled by a ghostly world-weariness and the characters’ self-consciously ritualized actions and gestures. A wonderful example of this occurs in the second half of Le deuxième souffle, when Orloff (Pierre Zimmer)—a loyal compadre who offers the desperate Gu his place in the gang—arranges to meet the other gang members to discuss Gu’s inadvertent betrayal of them to the police. As in Melville’s next film, Le samouraï, the main preoccupation in this scene is with process, the meticulous preparation that leads toward what we might call action. Both Orloff and a member of the gang “case” the arranged meeting place first, looking to gain the upper hand, but also preempting the generic requirements of the scene. These preemptory actions highlight the gestural and sartorial qualities and definitions of these characters, their movements having both a narrative and an archetypal function and origin. Orloff seems to be rehearsing the poses of his archetype—and he really is little more—theatrically prestaging the various postures and stances of the standoff that will occur. His awareness of the situation, of his place in the world, and of how this scene will unfold is characteristic of the existential, worldly, and ritualistic nature of Melville’s world. Similarly, it is not until Gu changes into clothing more closely resembling that of a gangster that he is able to break free, even if only briefly, from his clandestine existence. One of the most remarkable aspects of Le deuxième souffle is its treatment of time. This emphasis is clearly signposted by the almost maddening preponderance of dates and times that appear on the screen, drawing attention to both the procedural and quotidian dimensions of the film we are watching. This play with time, its fragmentation and our awareness of it, places Le deuxième souffle clearly within the realm of the sixties European art movie. But Melville’s film is actually one of the most contemplative and quiet of all crime films, and his concern with time also has more profound implications. Love, friendship, communication, self-respect, and “life itself” are not impossible in Melville’s cinema but are explicitly finite or time-bound. The bittersweet, gruff, highly stylized but deeply felt quality of the director’s work suggests that his preoccupation is less with feelings of contemporary isolation—common in sixties art cinema—and the opportunities that sound and image “situations” offer for compositional abstraction, à la Antonioni, than with the melancholy contemplation of the play of intimacy and inevitable betrayal. Ultimately, Le deuxième souffle offers one of the richest and starkest portraits of the Melvillean universe. Adrian danks is head of cinema studies in the school of Applied Communication at Royal melbourne institute of Technology (university). He is cocurator of the melbourne Cinémathèque and CTeQ: Annotations on film editor for Senses of Cinema.